Vegafish develops closed loop, land-based indoor systems for aquaculture, based on the biomass method. 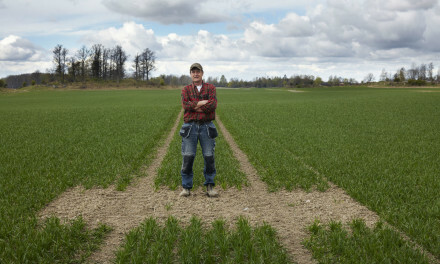 A pilot plant in Uppsala is already up and running, and a production plant in Bjuv is expected online by summer. In a continuous process, food industry waste products and waste heat are converted to nutrients and energy for a biomass of microorganisms. This in turn acts as both food and as a vehicle to process the waste produced by the shrimp. Compared to traditional shrimp farming, there are no emissions or antibiotics used (which would kill the biomass). It all rests on a proper balance in the system. The first production cycle is already earmarked for restaurant consumption. In cooperation with Findus, frozen prawns are planned for grocery store distribution from 2016 to 2017. The facility in Uppsala is partly financed by industry group Matlandet, and by the EU’s European Fisheries Fund. Cultivating shrimp in efficient, closed and indoor aquaculture environments with waste heat products is a growing and unique trend. Swedish company Vegafish has started cultivating jumbo shrimp together with food giant Findus. The shrimp are grown indoors in a closed aquaculture environment using waste heat and waste products. It is a well-tuned and environmentally efficient system that is growing globally in popularity. A flock of microorganisms process the system so well that water does not need circulation. The first larvae are already in place. In an industrial facility in Uppsala, not far from a heating plant, life comes to bear in brown and shimmering tropical waters. Here, 300,000 jumbo shrimp larvae imported from Florida spend three months growing in 30-degree water before being harvested. Moisture rises between the corrugated metal walls. The shrimp and water-bound microorganisms need the heat supplied from the district-heating network. And UV lamps hanging over the plastic covered cultivation tanks stimulate algae growth. 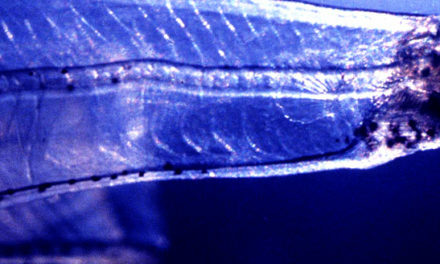 The newly arrived shrimp larvae are quiet and hiding in an impenetrable brown and green biomass. Hygiene requirements are high necessitating protective clothing. “The biomass is a mixture of different microorganisms – bacteria, algae, yeast – which act both as fodder and purification. The microorganisms become fodder for shrimps, but they also break down the shrimp feces and purify the water. 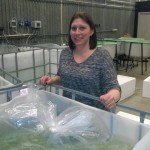 Actually, I never feed the shrimp but I always feed the biomass,” says Matilda Olstorpe, CEO of Vegafish AB and associate professor of microbiology at SLU, emphasizing the uniqueness of the system’s symbiosis. Some shrimp are also grown with traditionally methods in algae-enriched outdoor pools. The algae absorb nitrogenous waste from the shrimp and return it as nutrients – a system which is notoriously difficult to keep in balance. The advantage of the bacterial biomass method is that the process can be moved indoors in a controlled environment. Only then are the parameters of the process controlled in detail – temperature, light, nutrients and water – which in turn makes it possible to fine-tune the balance in the defined ecosystem to make it work optimally. When the system is well tuned, it becomes robust against changes. And the water quality becomes largely self-regulating. “The way of working with the biomass has been around for 5,000 years. What is new is the holistic environmental approach pairing the cultivation with waste heat, and using the nutrient flows that are available to feed the biomass,” says Olstorpe. She says aquaculture in closed systems is an increasingly popular concept. “It’s starting to bubble up around the globe and varies according to local geographies and regulatory systems,” she says. Sweden’s Minister of Rural Affairs inaugurated the unique facility in Uppsala recently, before the shrimp arrived so as not to risk their fragile quarantine. But Uppsala is just a small pilot plant. A full-scale production facility is under construction in Bjuv. In the venture, Vegafish is responsible for the shrimp cultivation and method development. 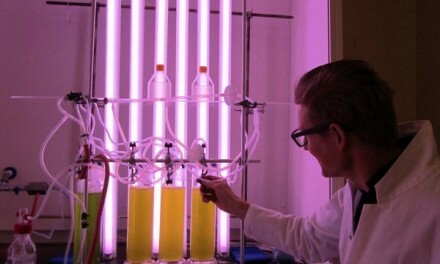 Findus in turn helps with the residual heat from its cold storage and waste products, such as peas and fish waste, which now become fodder for the biomass instead of being turned into biogas. Findus also manages the subsequent stages in the form of freezing, packaging, distribution and sales. “We use land directly adjacent to Findus’ facility, so we are close to a heat source and minimize transport. Looking ahead, we see opportunities to expand the facility in Bjuv, but we would also like to open in other places to offer fresh production close to customers,” says Olstorpe, optimistically. “We need to cultivate in such a way that does not affect the surrounding environment as much as traditional methods. One has to think a little more in terms of circulation. Just look at the Swedish regulatory system, which today stipulates that fish farming should be a zero sum game in terms of pollutants and nutrients. We fall a little outside this framework with our system,” says Olstorpe. Cultivation is a closed system. The same water remains through all stages of development. “We don’t impact the environment in that way. Our processes are closed in terms of nutrients and water, so nothing gets out. The buildings and pools are insulated and we cannot use antibiotics because it would knock out our own food and cleaning systems. Our focus is on prevention to ensure good quality water and avoid disease outbreaks,” says Olstorp. ASC is one of several global sustainability labels for farmed fish and seafood products. The certifications are not always suitable for those promoting new methods. Vegafish is currently implementing the required ASC documentation but has encountered some complications. “We expect ASC certification later this year. But not everything applies to us. There are no regulations for indoor growing yet – so we have to proceed from pond-culture regulations and adapt them. But that is as environmentally friendly as possible, so there is a common interest,” says Olstorpe. The current focus on prawns or jumbo shrimp depends entirely on the past disadvantages of traditional cultivation methods – that there is a great need for eco-efficient options, and a great demand. But the concept is more general, and ambitions extend further than this. Eagerness shines when Olstorpe explains what is still left to do.